The plan now is to promote and raise Rikki Nicks to a world class level of tribute entertainment. 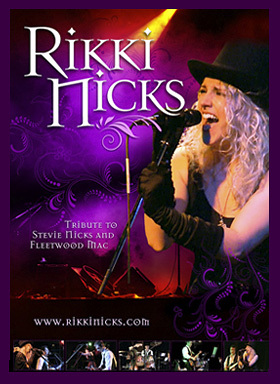 Based on decades of performing experience, fuelled with the love of connecting with an audience, the entire Rikki Nicks Band will turn any event into an evening of pure nostalgic heaven. The band captures a Fleetwood Mac groove to perfection, and the connection between Rikki and Kyle bring you right back to the days of Stevie Nicks and Lindsey Buckingham as they took the audience on a wishful journey. It’s an evening you’ll never forget.